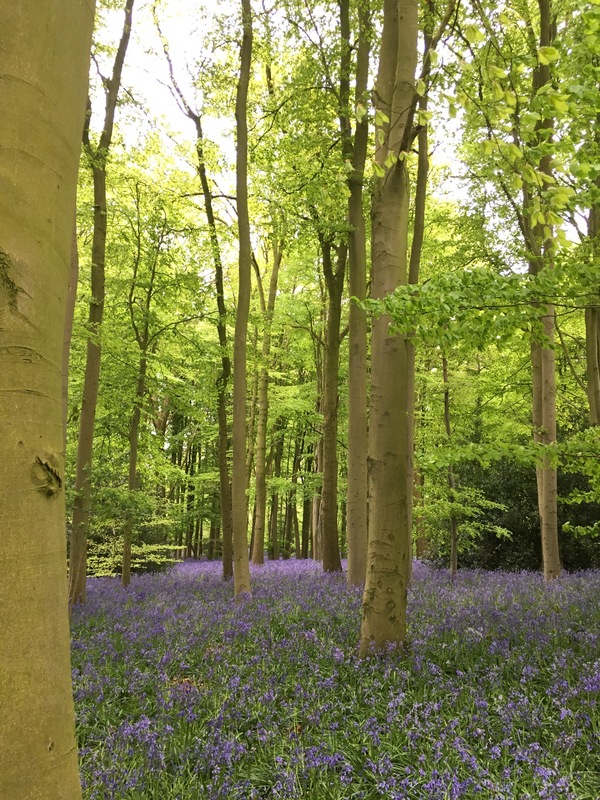 Last chance to visit bluebell woods….. Cold weather has held back the bluebells this year. They are still looking glorious. Last chance to visit Coton Manor tomorrow. Here’s some photos from our visit today. As usual, we started with a picnic. Spreading our rugs under the branches of some apple trees, we tucked into home-made bread and warming soup, followed by an array of cakes and shortbread. A great start to our garden visit. Our little haven can be found at the far end of the car park. Funnily enough, we’d never noticed the orchard before. But full of blossom today, we could hardly miss it. Next we set out to visit the bluebells. As you can see, the bluebells are at their peak of perfection. It’s a sight I’ll hold in my memory until next spring. That blue, with the unfurling lime green leaves, and the honey scent. Just glorious! We found the dogs’ graves. What a peaceful resting place. The gardens always provide breathtaking planting, deserving of a separate post. But for now, here’s a taster of what we found. Luckily the wisteria escaped any damage from the recent hard frosts. I love this view from the terrace steps. I wrote about visits to bluebell woods here mentioning Coton Manor and Hodsock Priory . For more information click on the highlighted words. 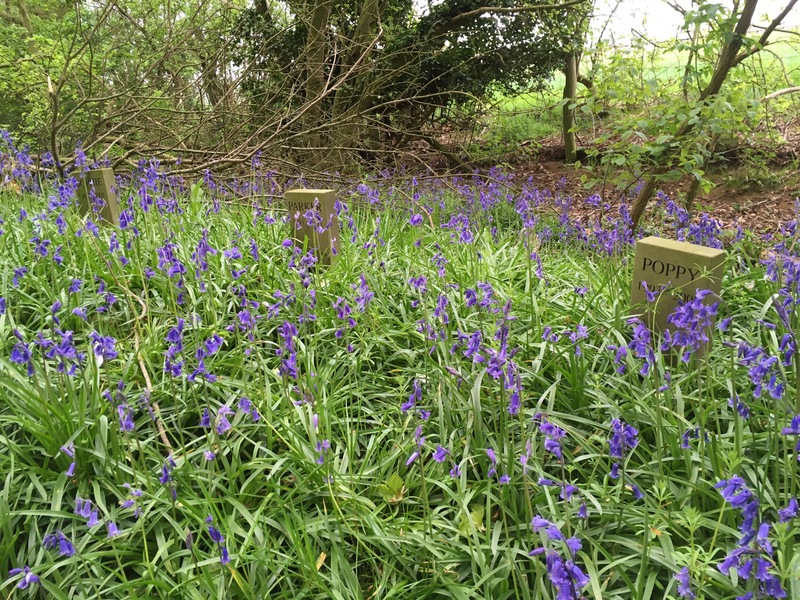 Also look at the Woodland Trust website for bluebell woods all over the country. Be quick to visit. They are at their best right now. That must be such a delight to experience! Beautiful post, Karen. Wow, those photos are absolutely gorgeous. What a magical place. 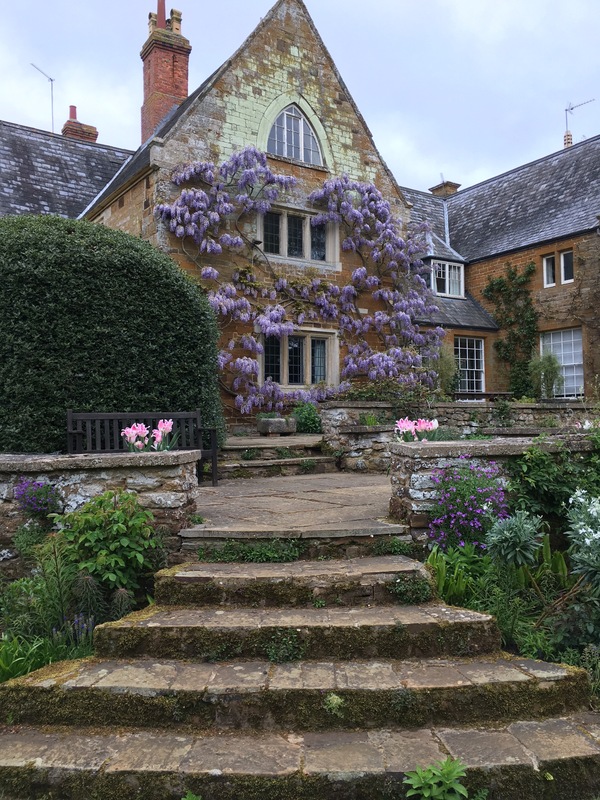 We spent a long weekend in Northamptonshire last year visiting NT gardens. This one will have to be on the list for the next visit. Thank you Mike. Hope you’ve had a good weekend on the plot. It was freezing cold on Saturday, but has warmed up a bit today. Just need more rain! Sooooooooooooooo beautiful, thanks for sharing, I love bluebells and the wisteria is a perfect picture too. Thank you Christina. The scent is amazing this year too. Just glorious. How beautiful. I don’t know which I like seeing most – the wild bluebells or the old wisteria. Are the bluebells the European mix (Spanish I think). rather than the true old English Bluebell? The picture evoked memories of Boreham Wood, now no longer in existence as a wood. A housing estate built on it many years ago bears the name. The only visible suggestion it ever did exist. Coton Manor wood has the native bluebells. They are much more dainty than the Spanish ones, and have flowers on one side of the stem. I have quite a problem with the Spanish ones in my garden. I bought them as English,but they turned out to be a mixture. Nightmare of a job weeding out the non-natives. I don’t think I’ll ever really get rid of them. Thanks for reading and getting in touch. D > Oh my goodness – the Wisteria.! Oh yes, and the bluebells too! Everything so big and tall and lush! Karen, every picture in this post is gorgeous. Thanks for sharing your visit with us. Gorgeous photos! What a charming and beautiful spot. Thank you for sharing! Oooh, loads of garden eye candy! 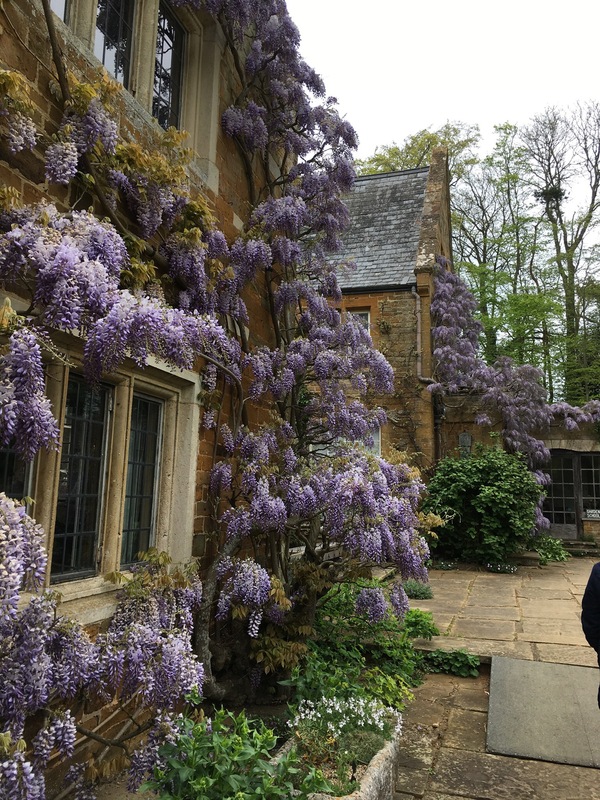 Wisteria will always stop me in my tracks – what is it about that plant, I wonder? 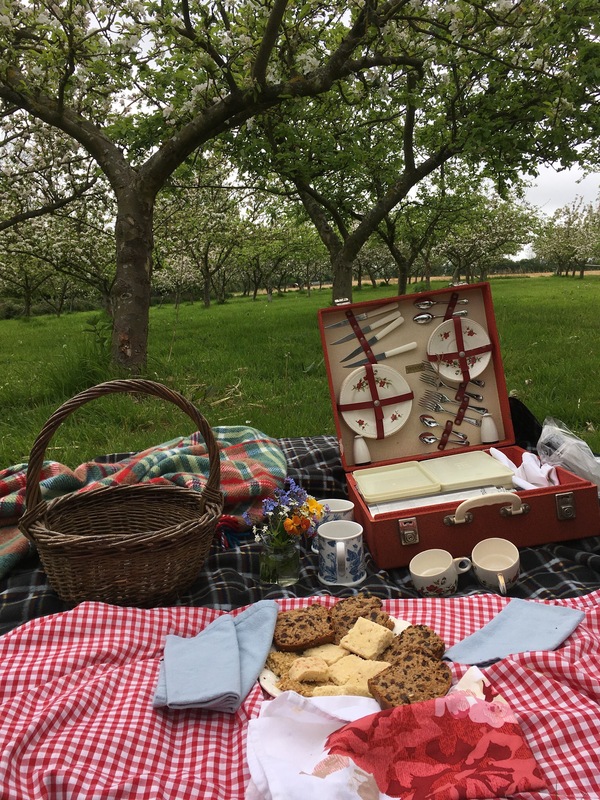 I know you went to see the bluebells but I absolutely love the orchard that you sat in to have your picnic. The trees are such a wonderful shape – a testament to the gardening team care they’ve received. I can see why you’d have an annual pass, well worth several return visits! Thanks for reading and getting in touch Caro. Come with me sometime. You would love It! Are you at Chelsea? Only a fortnight to go…..